The training programme familiarized participants with the use of Computational General Equilibrium (CGE) modelling as a tool for policy analysis and research. 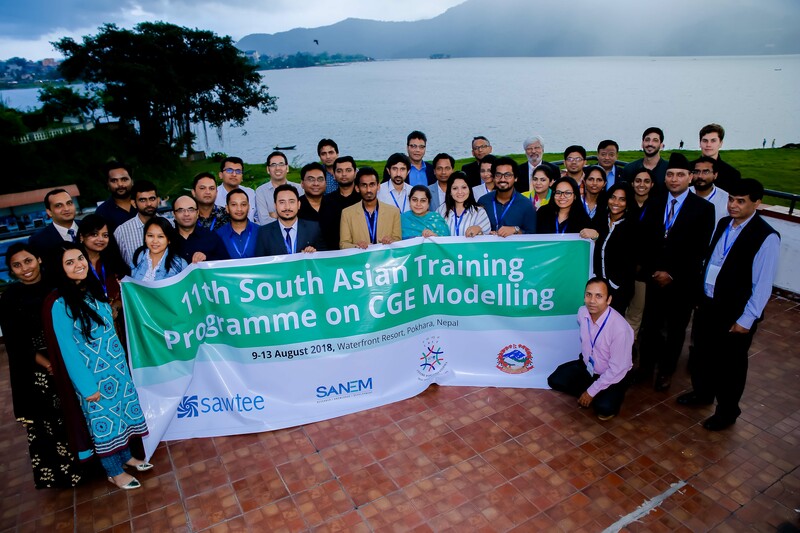 The five-day event included sessions on the construction of Social Accounting Matrices (SAM), calculation of SAM multipliers, and using GAMS software application to run CGE models. The training was conducted by the Executive Director of SANEM, Dr. Selim Raihan, also Professor of Economics at the University of Dhaka. 35 policymakers and young researchers from six South Asian countries, namely Afghanistan, Bangladesh, India, Nepal, Pakistan and Sri Lanka, participated in the event. In the closing session, dignitaries—Mr. Chandra Ghimire, Secretary, MoICS; Mr. Rabi Shankar Sainju, Joint Secretary, MoICS; Prof. Indra Prasad Tiwari, Dean, School of Humanities and Social Sciences, Pokhara University; and Dr. Posh Raj Pandey, Chairman, SAWTEE—all stressed on the need for such capability enhancing initiatives. They highlighted that the trainees, from six countries in the South Asian Association for Regional Cooperation (SAARC) region, were not just assets for their respective countries but for the entire region.